MassageTableRentals.com website service. The new west coast location reduces both transit time and cost of delivery for medical, massage and cosmetology educators and organizers that use portable tables in classes, demonstrations, health screenings, trade shows, events, and media shoots. “We needed to be a more on-demand service for our west coast customers, and have equipment available sooner than we can fulfill from our Chicago area warehouse,” says NaperMed's President Allison Ishman. “We carefully screened for the right fulfillment partner who could also offer courier services, and are pleased to have found partners in Las Vegas and Los Angeles for the courier services needed in those cities,” said Ishman. NaperMed Inc. serves clients such as Merle Norman, Saks Fifth Avenue, the American Physical Therapy Association, NBC, American College of Pediatrics, NASA, Philips Medical, and others. 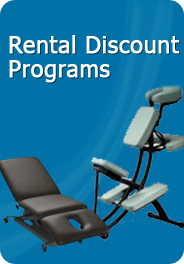 For questions, visit massagetablerentals.com or call 800-687-5199 x3.